France, during the Napoleonic Age, had superior commanders in comparison to its opponents. This section will list commanders for every aspect of the game. 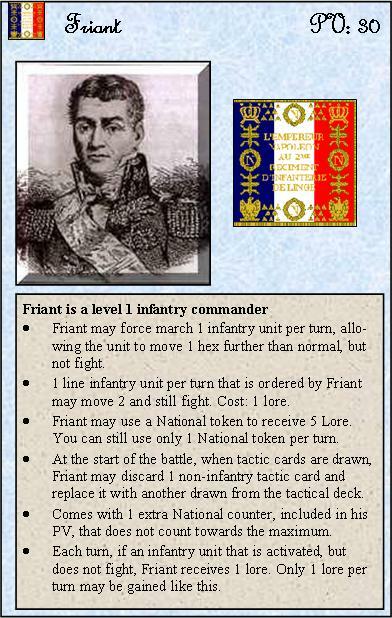 Less famous generals like Foy, Reille and Duhesme but also Famous French Marshals like Lannes, Davout, and so on. And finally: Napoleon himself. We have made army cards to represent them, so you easily find their points value and special abilities. If you want your leader present on the battlefield, check out our Leaders in the field rules. (Note that they are slightly different for the Napoleon version than for the normal Battlelore version that we also have on this site). 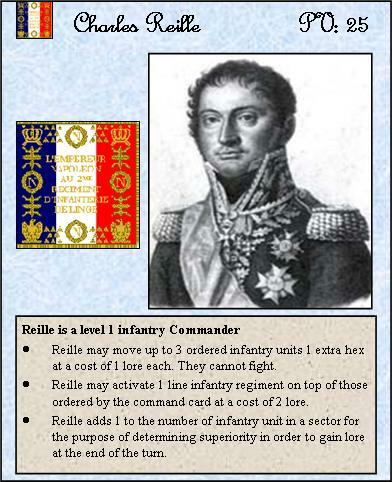 Reille commanded the II Corps during the battles of Quattre Bras and Waterloo. He was a veteran, having fought in Spain and Portugal. Today, there have been 6 visitors (46 hits) on this page!